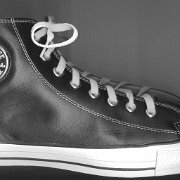 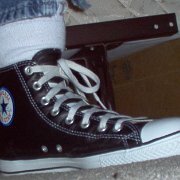 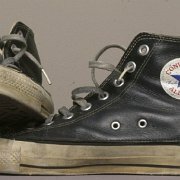 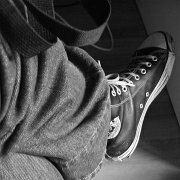 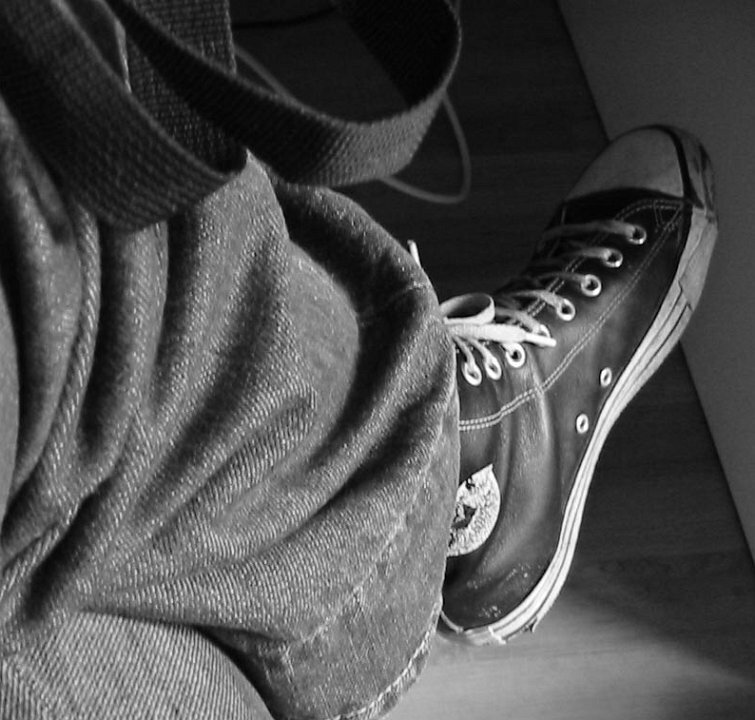 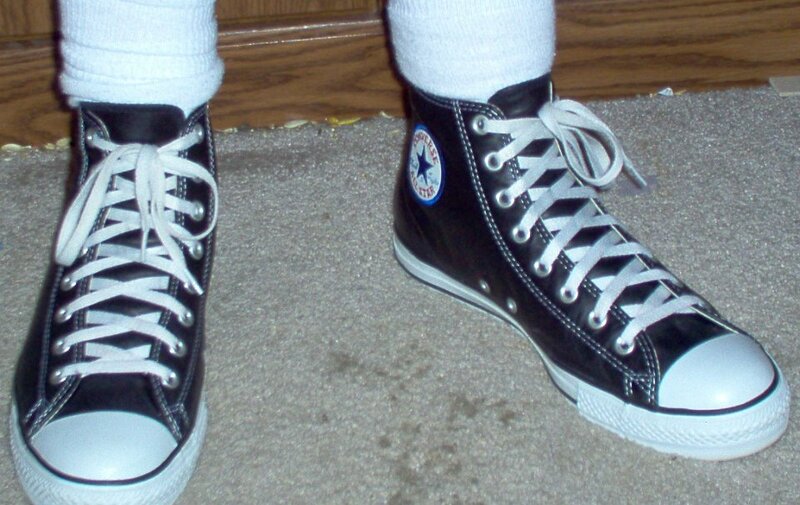 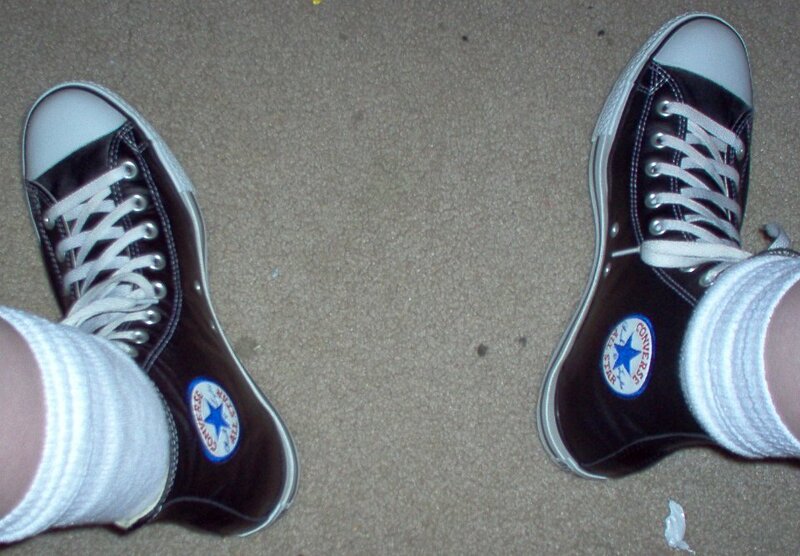 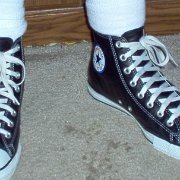 Photo gallery of high top and low cut chucks with leather uppers. 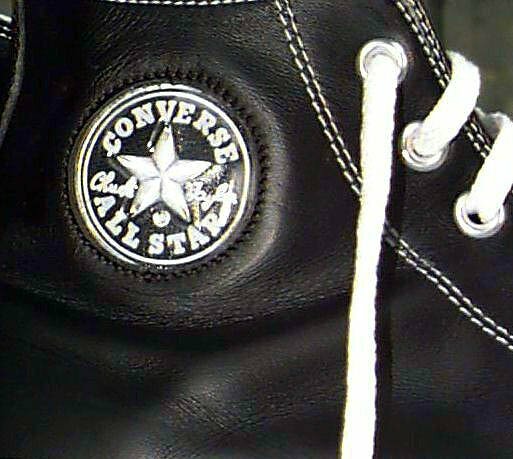 1 Leather Chucks Black bomber high top, inside patch view. 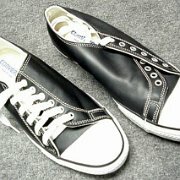 2 Leather Chucks Black bomber low cut, side view. 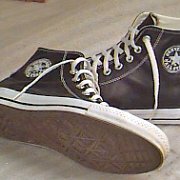 3 Leather Chucks Black Euro high top, rear view. 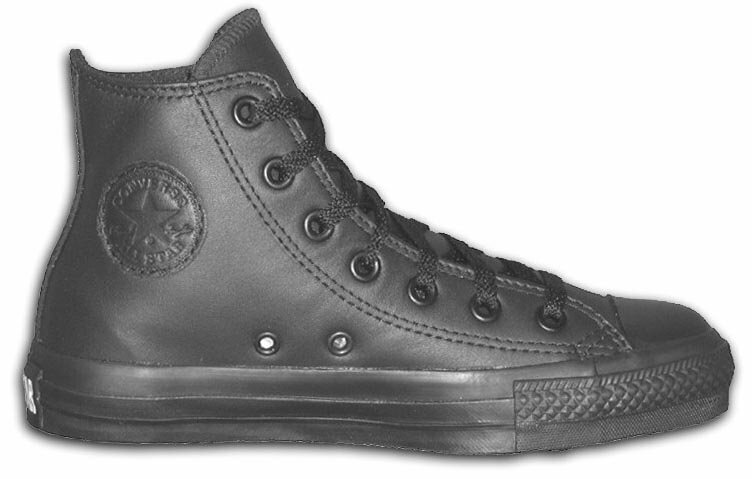 4 Leather Chucks Black Euro high top, inside patch view. 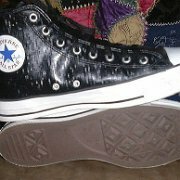 5 Leather Chucks Black jewel high tops, outside patch view. 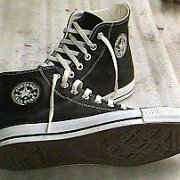 6 Leather Chucks Black jewel high tops, outside patch view. 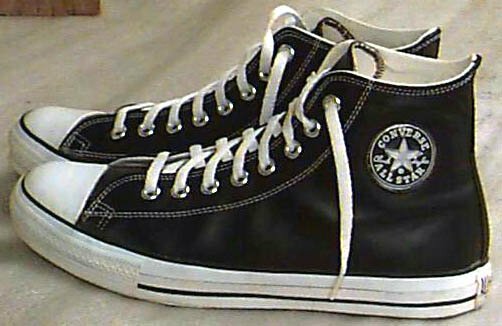 7 Leather Chucks Black jewel high tops, outside patch views. 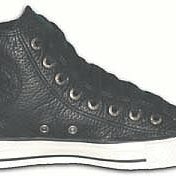 8 Leather Chucks Black jewel high tops, outside patch views. 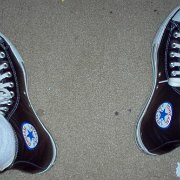 9 Leather Chucks Black jewel high tops, outside patch views. 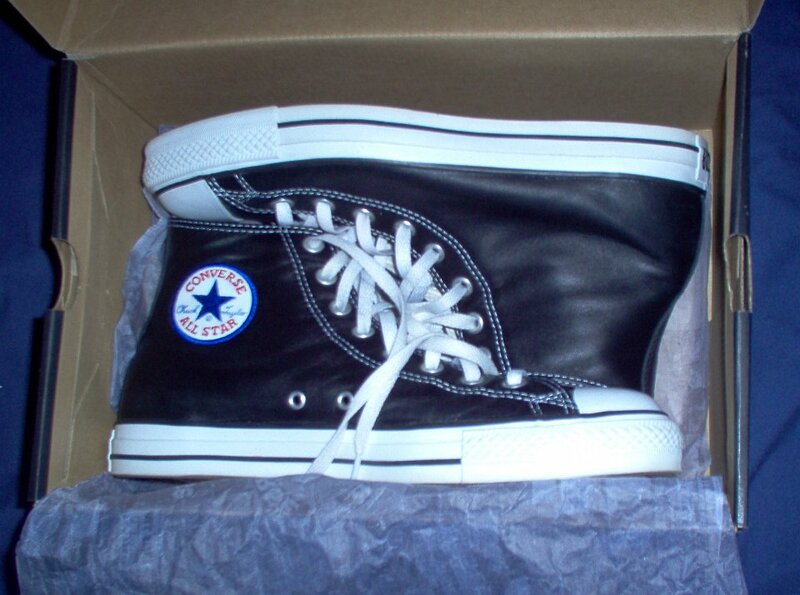 10 Leather Chucks Black jewel high tops, angled rear view. 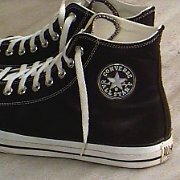 11 Leather Chucks Closeup of the jewel patch on a right black jewel high top. 12 Leather Chucks Black jewel high tops, outside view. 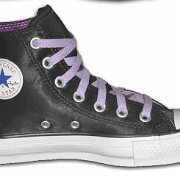 13 Leather Chucks Black jewel high tops, outside patch views. 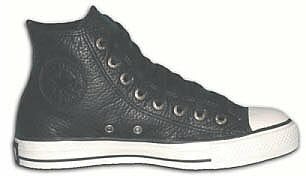 14 Leather Chucks Black jewel high top, outside patch views. 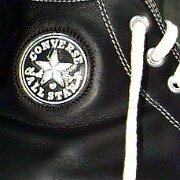 15 Leather Chucks Black leather left high top, inside patch view. 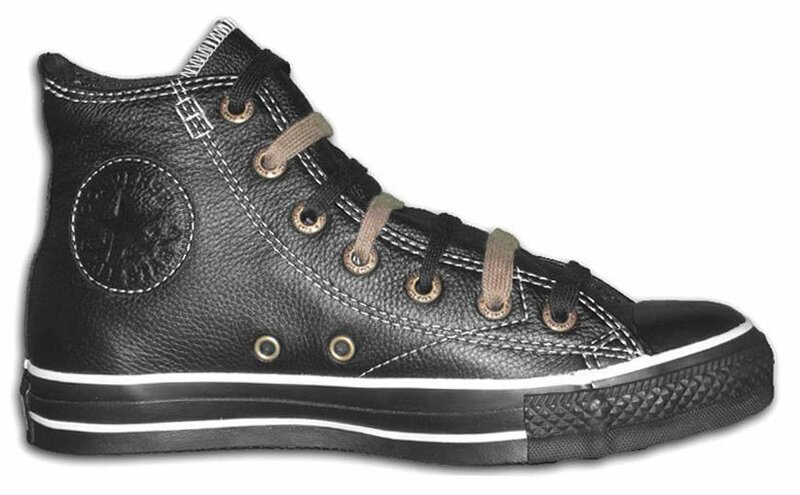 16 Leather Chucks Right black leather high top, inside patch view. 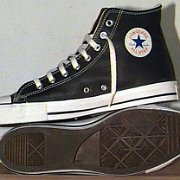 17 Leather Chucks Black grain leather high tops, outside views. 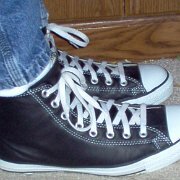 18 Leather Chucks Black leather high tops, front view. 19 Leather Chucks Black leather high tops, rear view. 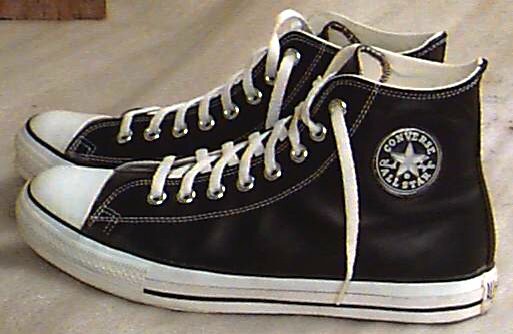 20 Leather Chucks Black leather high tops, inside patch and sole views. 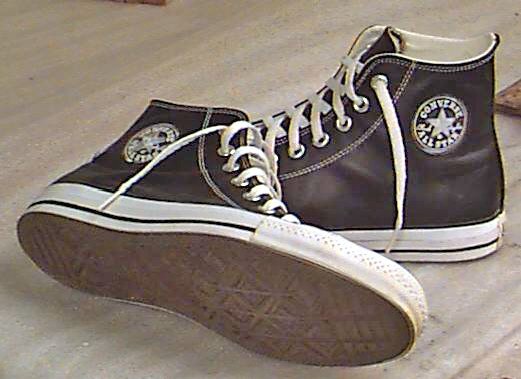 21 Leather Chucks Black leather high tops, top view. 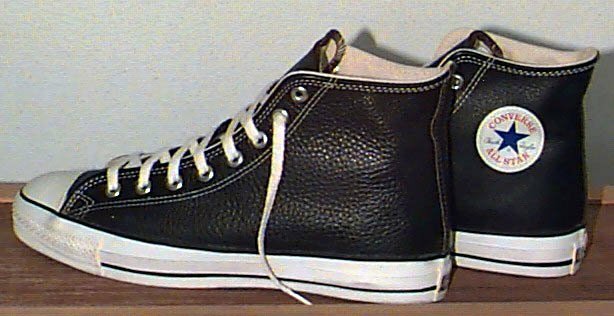 22 Leather Chucks Black leather high tops matched with black jewel high tops, side views. 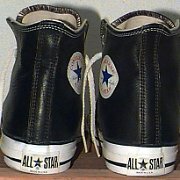 24 Leather Chucks Close up of a black leather high top with velcro straps. 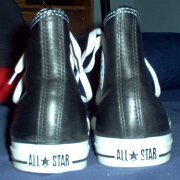 25 Leather Chucks Right black leather high top, angled inside patch view. 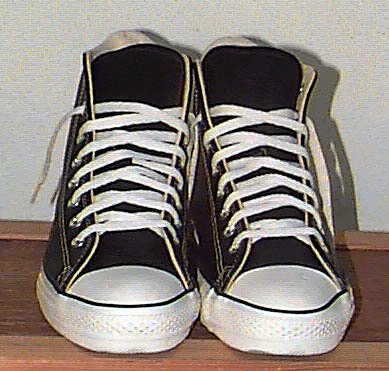 26 Leather Chucks Worn black leather high tops, top view from front and rear. 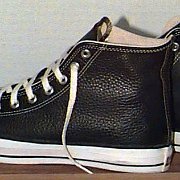 27 Leather Chucks Worn black leather high tops, side views. 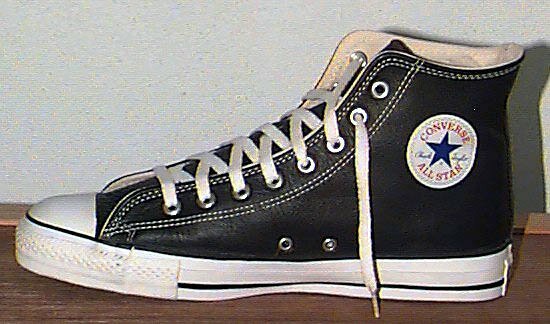 28 Leather Chucks Stepping out in a black leather high top. 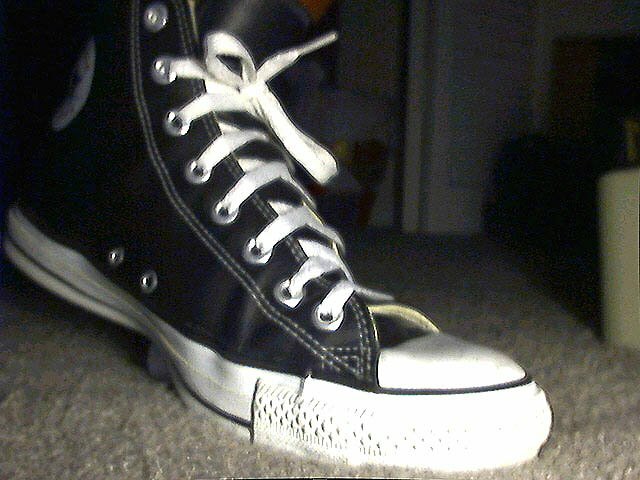 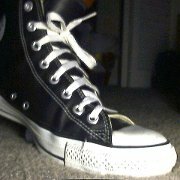 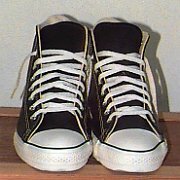 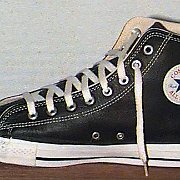 29 Leather Chucks Wearing black leather high tops, front view. 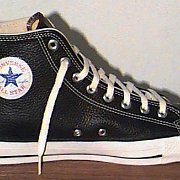 30 Leather Chucks Black leather high tops with black laces, front and rear views. 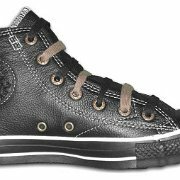 31 Leather Chucks Black leather high tops with black laces, inside patch and sole views. 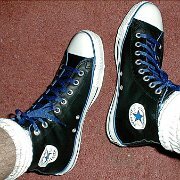 32 Leather Chucks Black leather high tops with blue piping and laces. 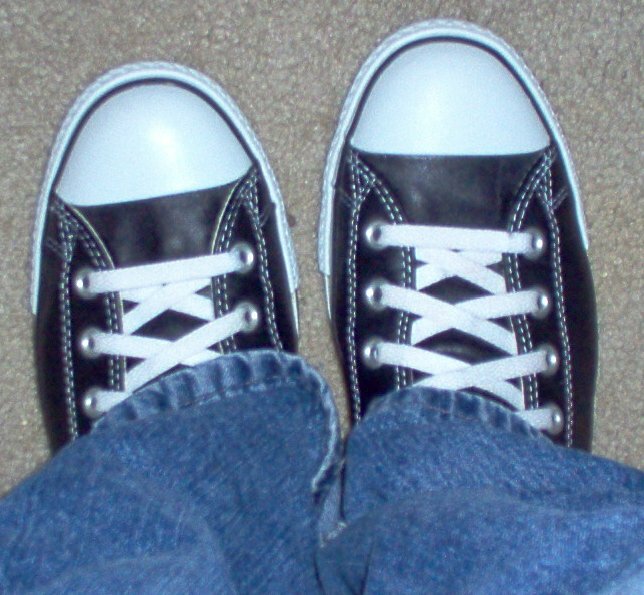 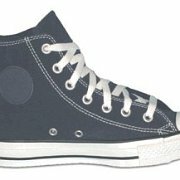 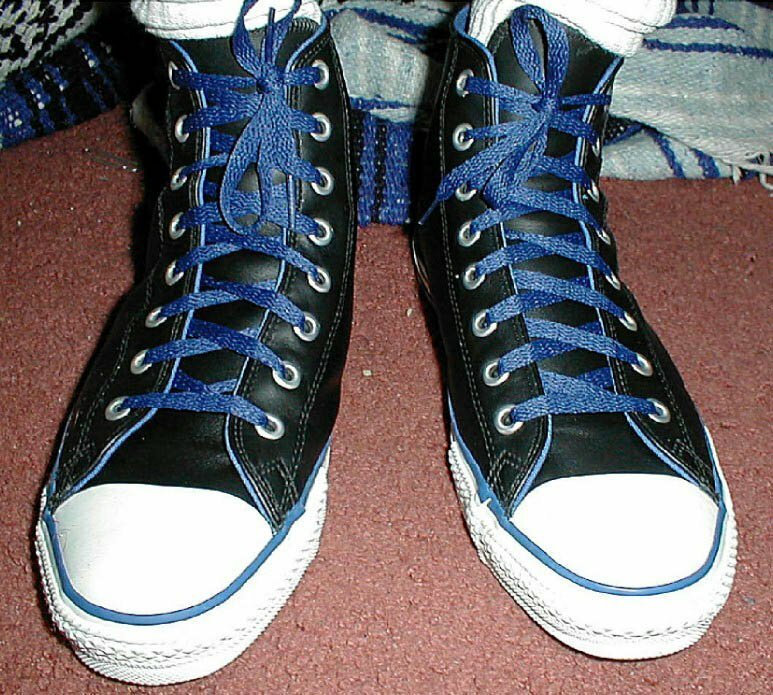 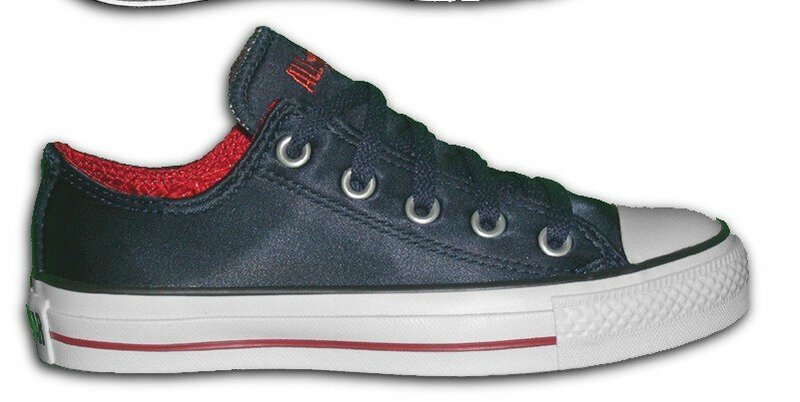 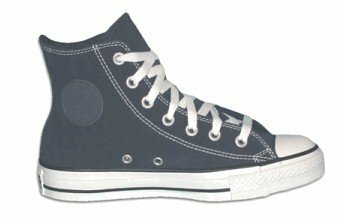 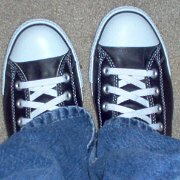 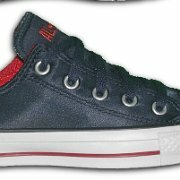 33 Leather Chucks Wearing black leather high tops with blue piping and laces, angled top view. 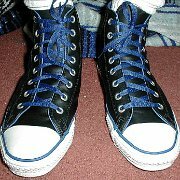 34 Leather Chucks Black leather high tops with blue piping and laces, front view. 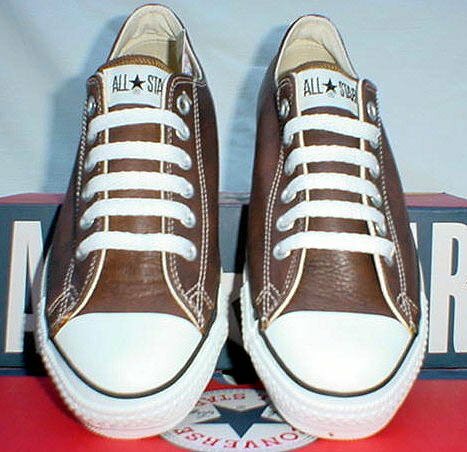 35 Leather Chucks Worn leather high top, front and inside patch views. 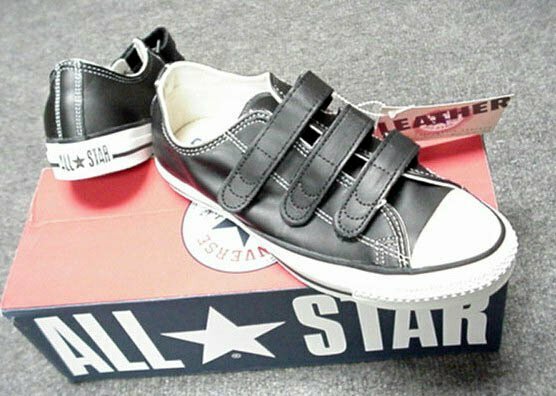 36 Leather Chucks Black leather low cuts with irregular leather sides, top view. 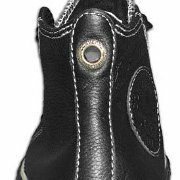 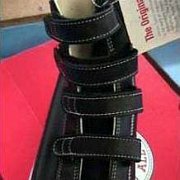 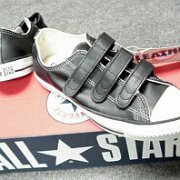 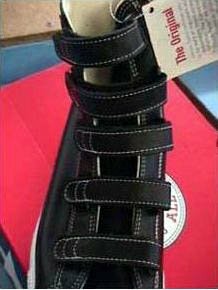 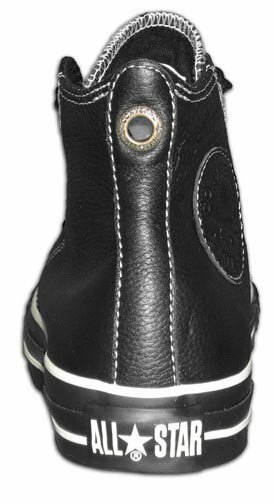 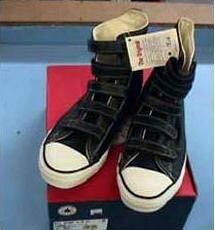 37 Leather Chucks Black leather low cuts with velcro straps, top and rear views. 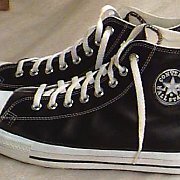 38 Leather Chucks Black leather low cuts, front view. 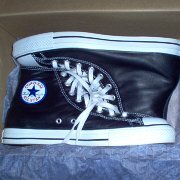 39 Leather Chucks Black patent leather low cuts, rear views. 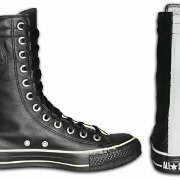 40 Leather Chucks Black monochrome leather extra high tops, side and rear views. 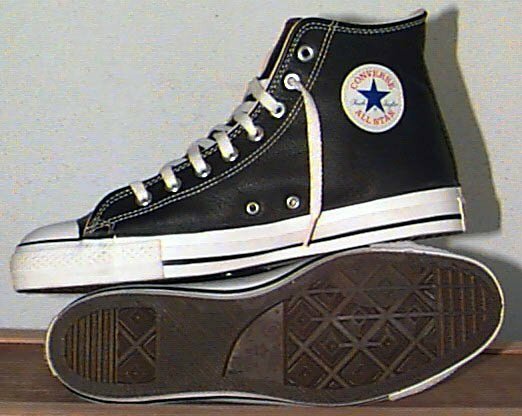 41 Leather Chucks Sole view of a left black leather high top. 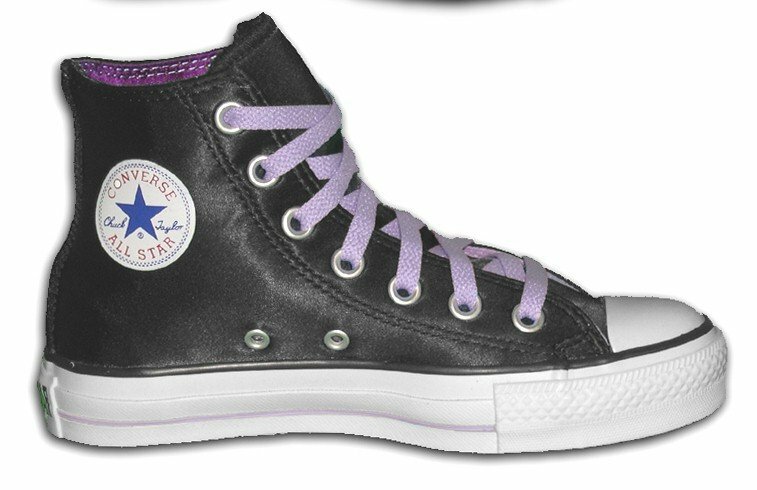 42 Leather Chucks Inside patch view of a left black leather high top with purple laces and racing stripe. 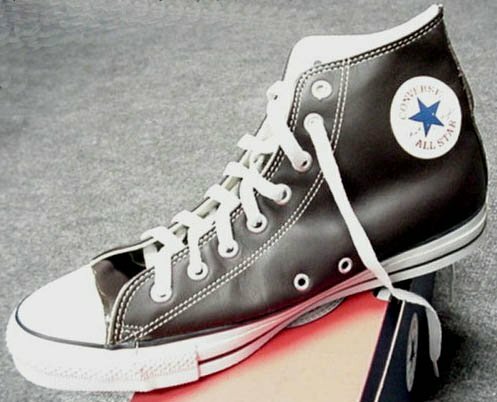 43 Leather Chucks Sole view of a black stain leather low cut. 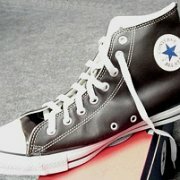 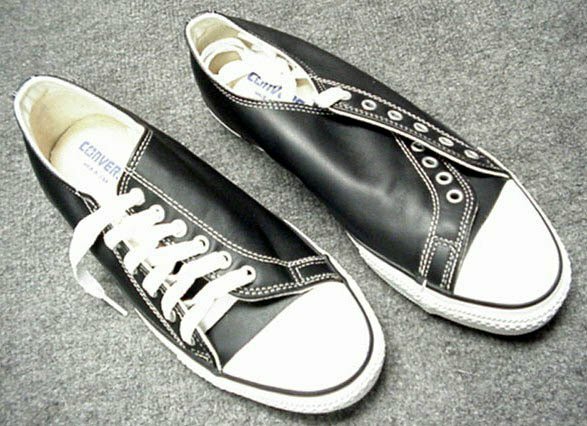 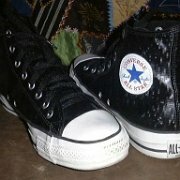 44 Leather Chucks Balck satin leather low cut. 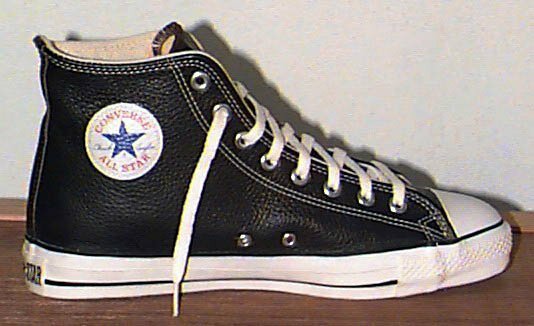 45 Leather Chucks Black suede high top. 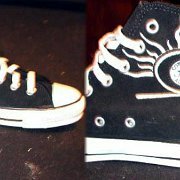 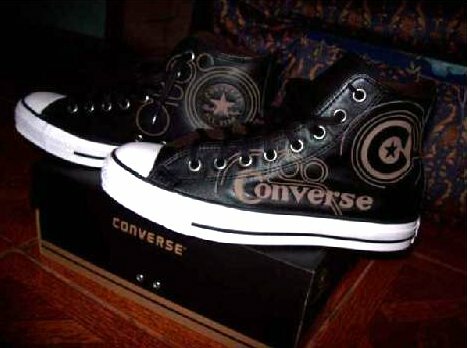 46 Leather Chucks Black sude high tops with custom graphics, side views. 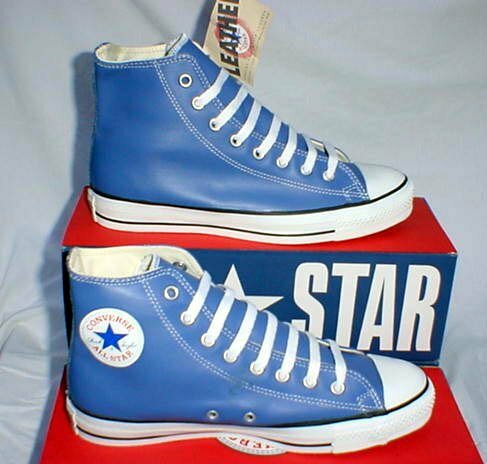 47 Leather Chucks Bright blue leather high tops with box, side views. 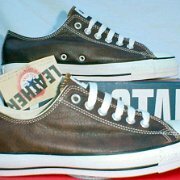 48 Leather Chucks Brown leather low cuts with box, side views. 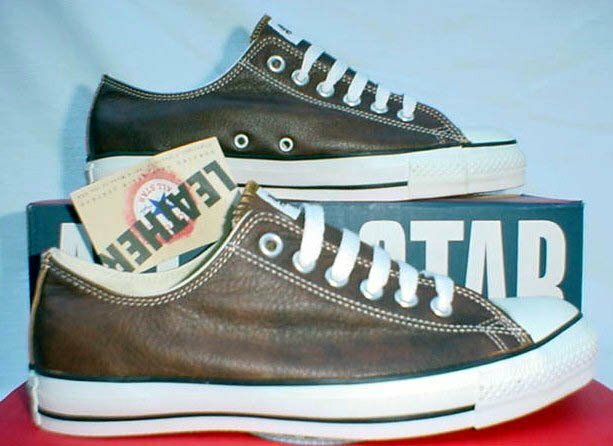 49 Leather Chucks New brown leather low cuts with box, top view. 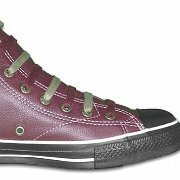 50 Leather Chucks Cranberry Euro high tops, inside patch and rear views. 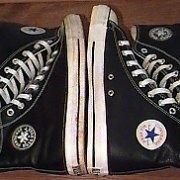 51 Leather Chucks Distressed leather high tops, front and side views. 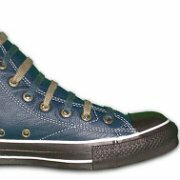 52 Leather Chucks Denim blue Euro leather high tops, inside patch and rear views. 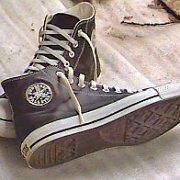 53 Leather Chucks Wearing black leather "iRobot" high tops. 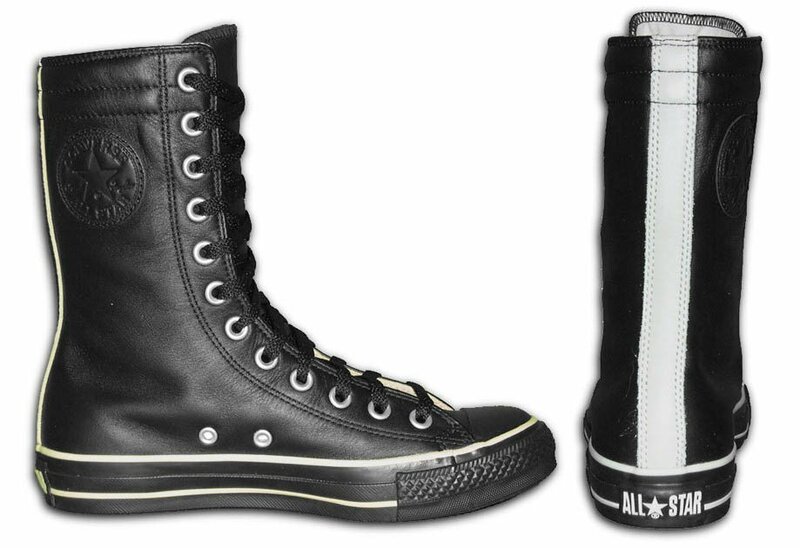 55 Leather Chucks Inside patch and outside views of black leather iRobot high top chucks. 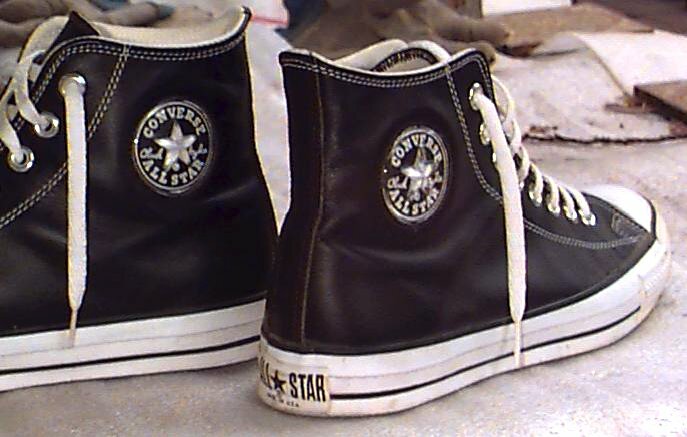 57 Leather Chucks Wearing black leather iRobot high top chucks, outside view. 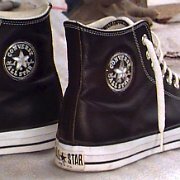 58 Leather Chucks Wearing black leather iRobot high top chucks, inside patch view. 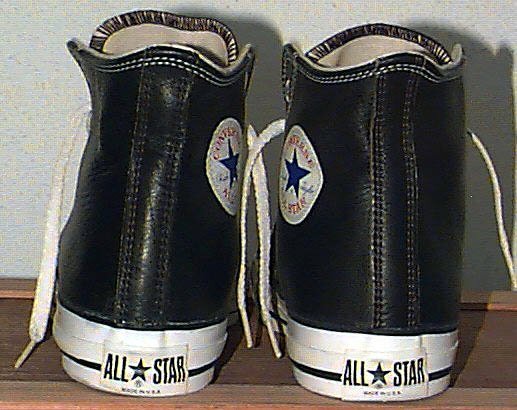 59 Leather Chucks Wearing black leather high top chucks, top view. 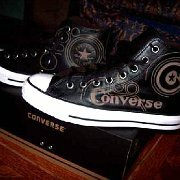 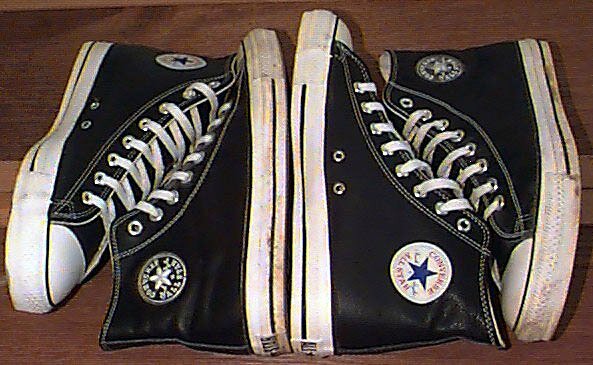 60 Leather Chucks Wearing black leather high top chucks, top view. 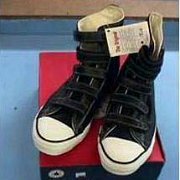 61 Leather Chucks Will Smith lacing up his "vintage" iRobot black high top chucks. 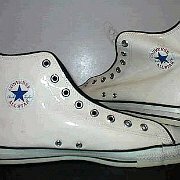 62 Leather Chucks White leather jewel high tops, outside patch and sole views. 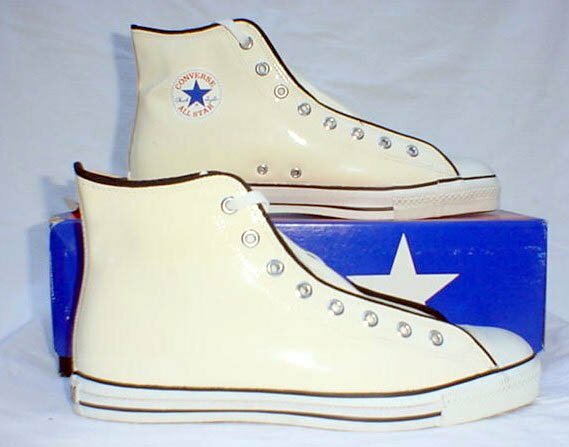 63 Leather Chucks White leather jewel high tops, side views. 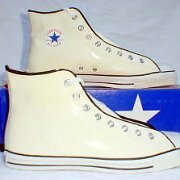 64 Leather Chucks White leather jewel high tops, front view. 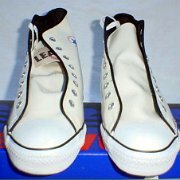 65 Leather Chucks White leather jewel high top, outside view. 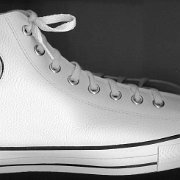 66 Leather Chucks White leather jewel high tops, outside patch and sole views. 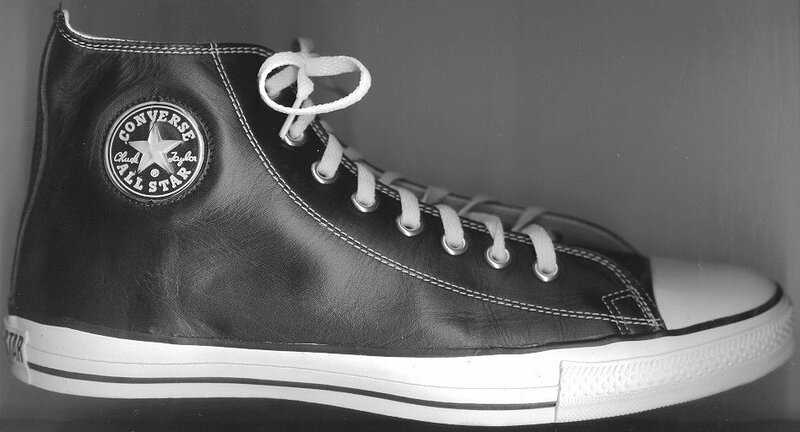 67 Leather Chucks Black monochrome leather high top, inside patch view. 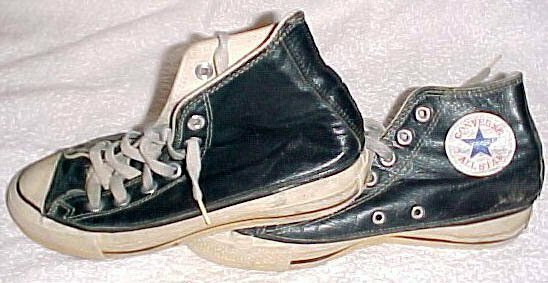 68 Leather Chucks Converse century leather high tops. 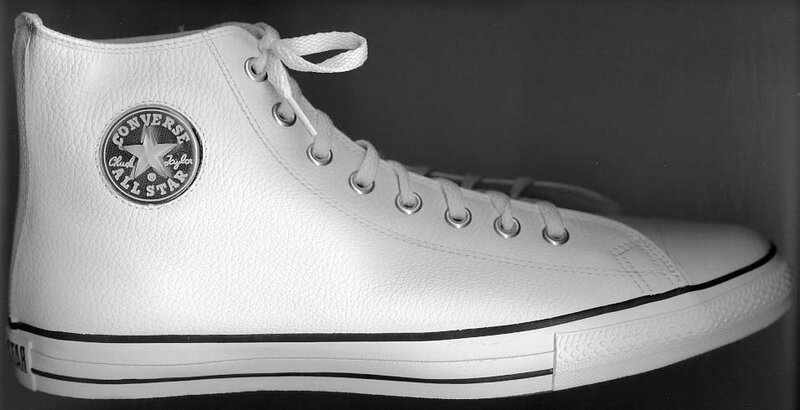 69 Leather Chucks White leather monochrome high top, inside patch view. 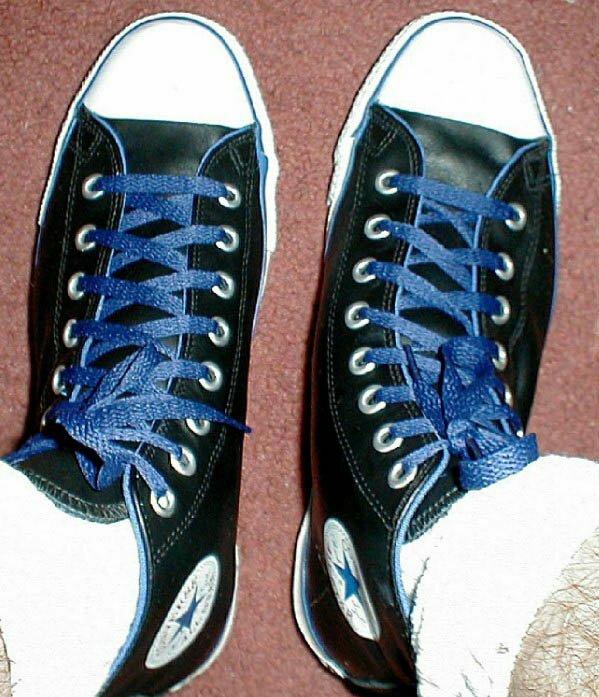 70 Leather Chucks Metallic blue high tops with black laces, side views. 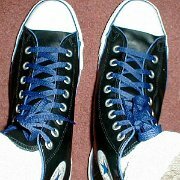 71 Leather Chucks Metallic blue high tops with black laces, top view. 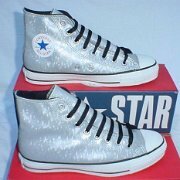 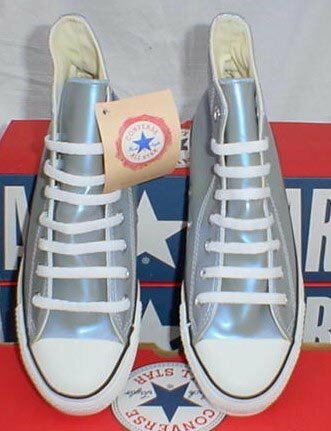 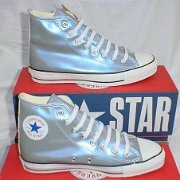 72 Leather Chucks Metallic blue high tops, side views. 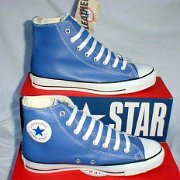 73 Leather Chucks Metallic blue high tops, top view. 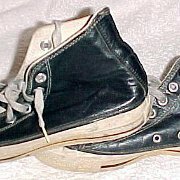 74 Leather Chucks Natural leather high top, inside patch view. 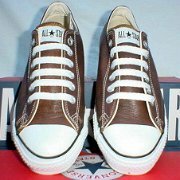 75 Leather Chucks Natural leather low cut, side view. 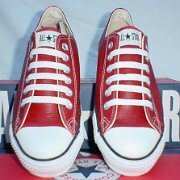 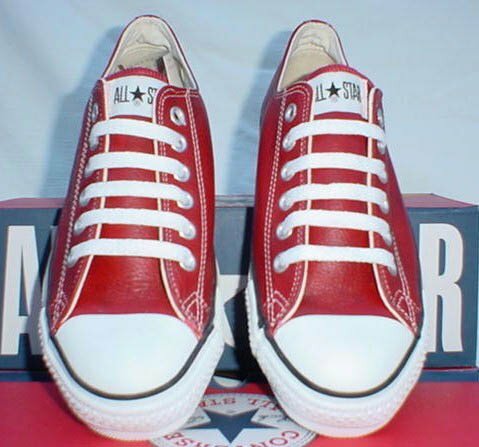 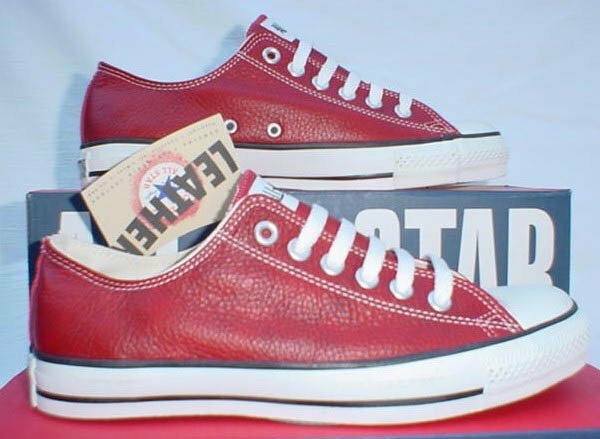 76 Leather Chucks Grain leather red low cuts, side views. 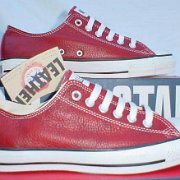 77 Leather Chucks Red grain leather low cuts, top view. 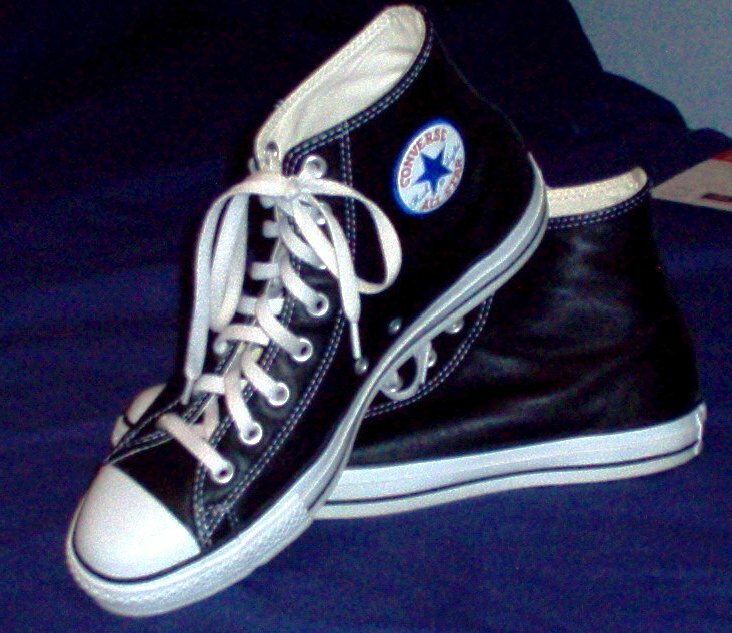 78 Leather Chucks Wearing worn black leather chucks. 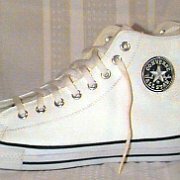 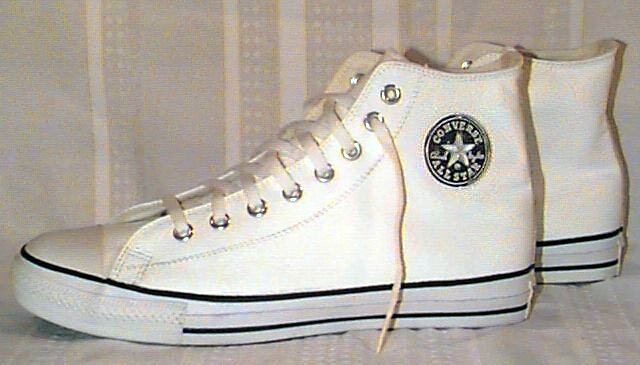 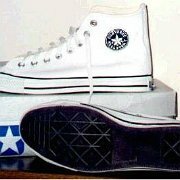 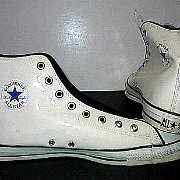 79 Leather Chucks White All Star 2000 mid high top, side view. 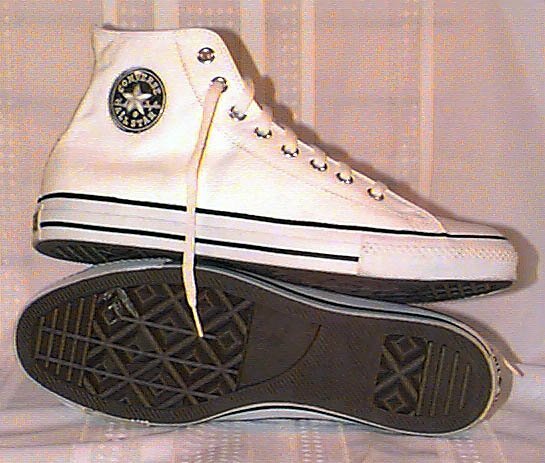 80 Leather Chucks White leather high top, inside patch view. 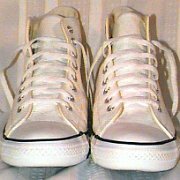 81 Leather Chucks White leather low cut, side view. 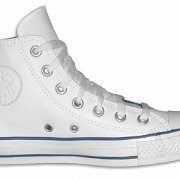 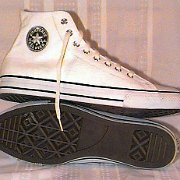 82 Leather Chucks White leather extra high tops, inside patch and rear views. 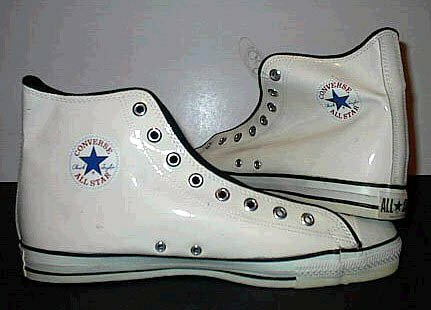 83 Leather Chucks White patent leather high tops, inside patch views. 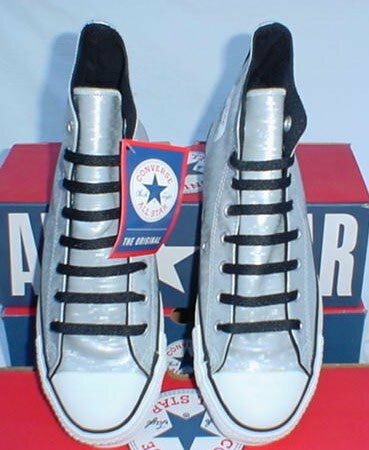 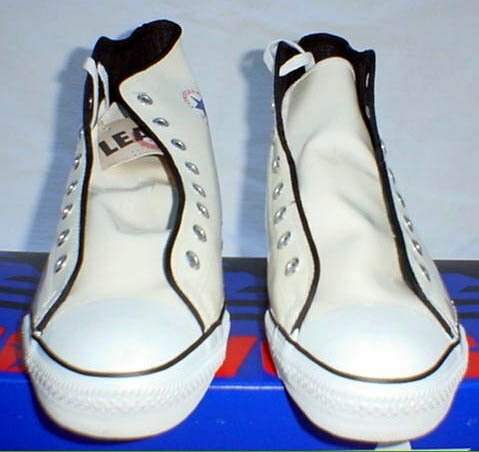 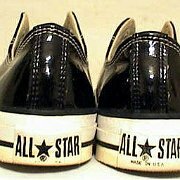 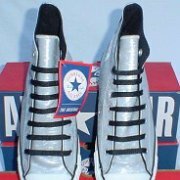 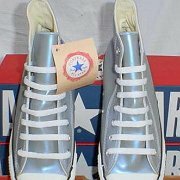 84 Leather Chucks White patent leather high tops, side and rear views. 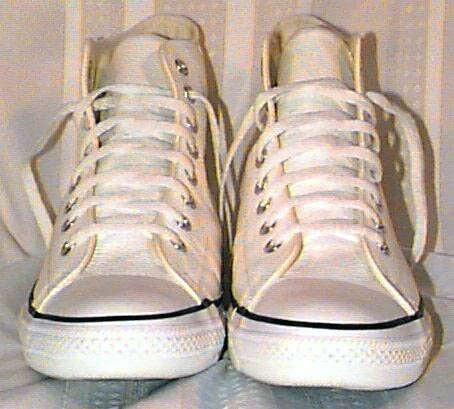 85 Leather Chucks White patent leather high tops, side views. 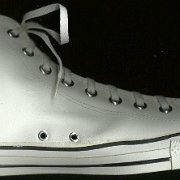 86 Leather Chucks Brand new white patent leather high tops, front view. 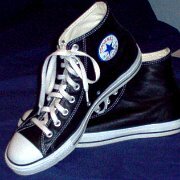 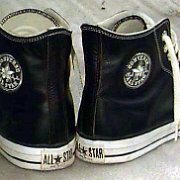 87 Leather Chucks Worn pair of black leather high top chucks. 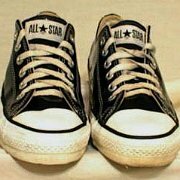 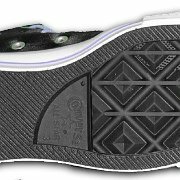 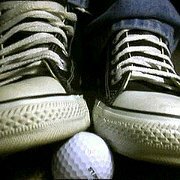 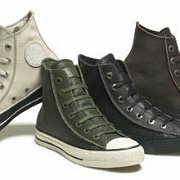 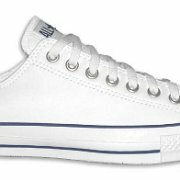 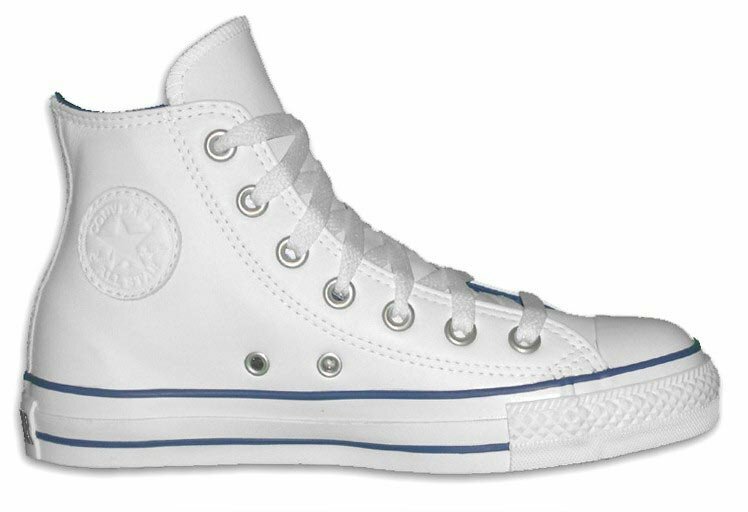 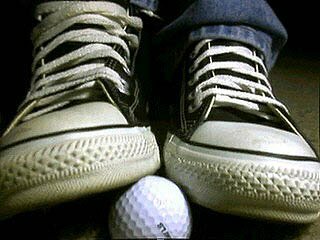 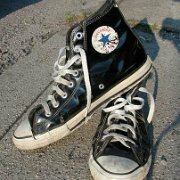 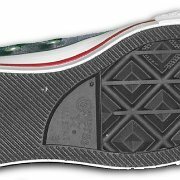 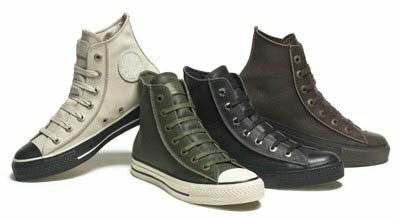 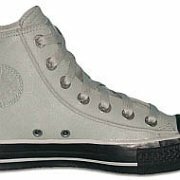 Over the years, Converse has manufactured models of chucks with leather uppers in a variety of colors. 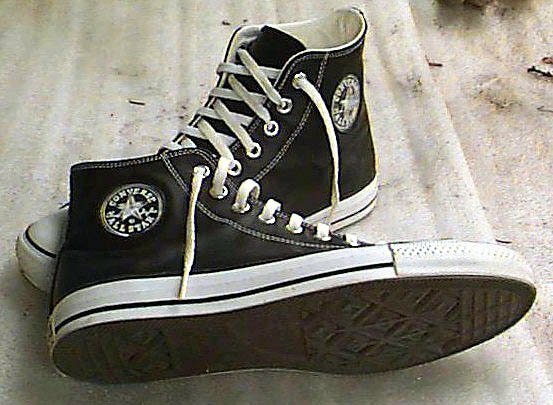 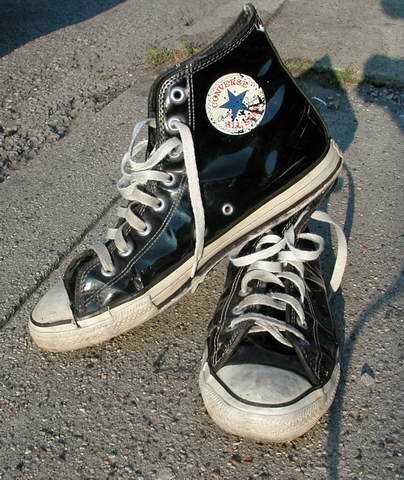 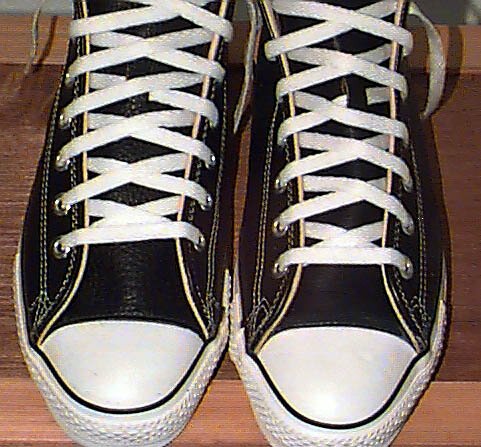 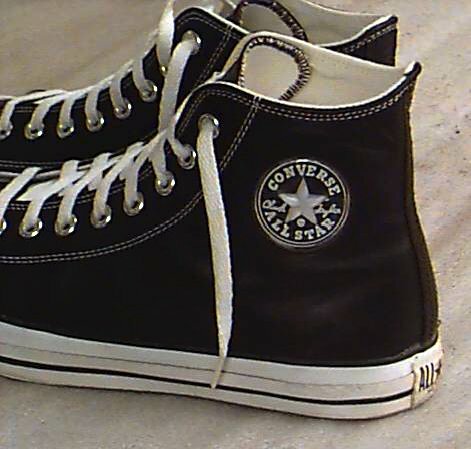 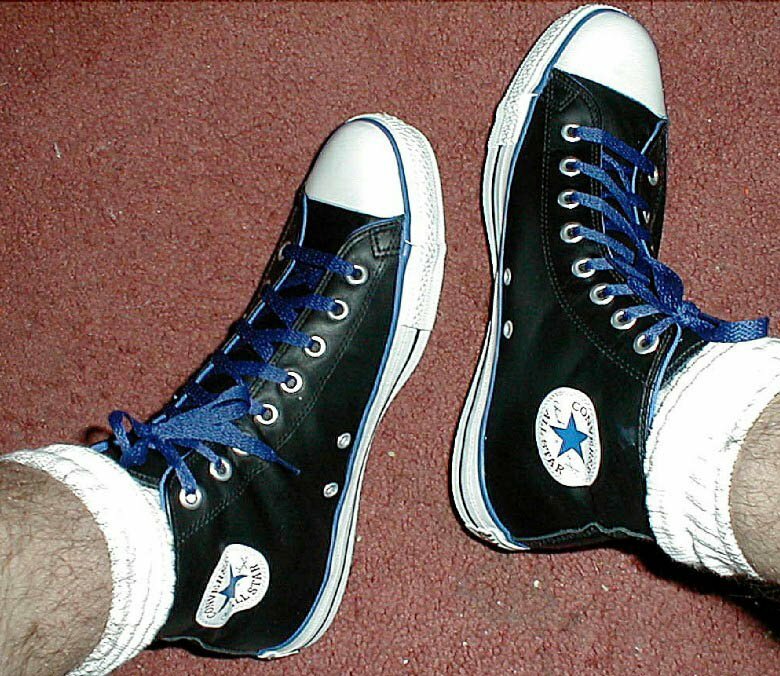 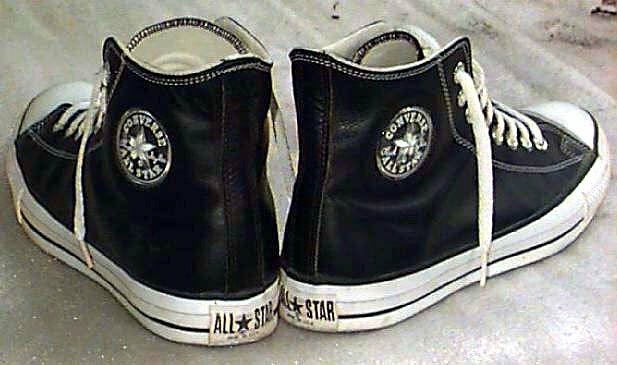 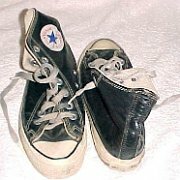 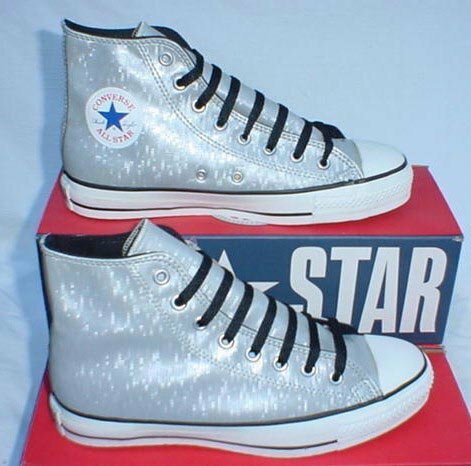 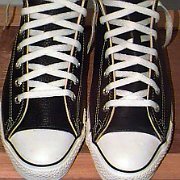 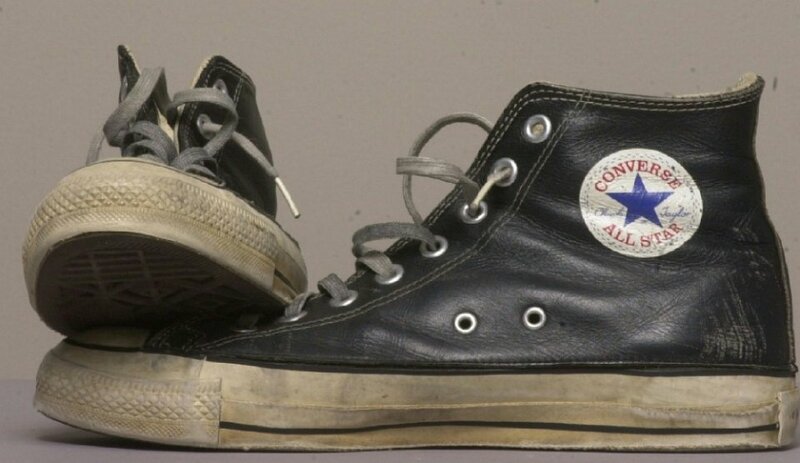 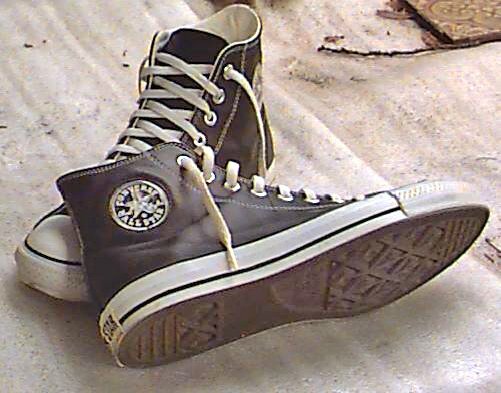 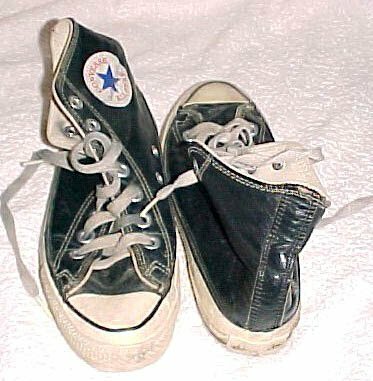 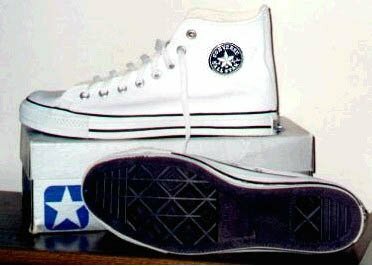 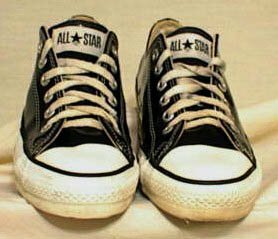 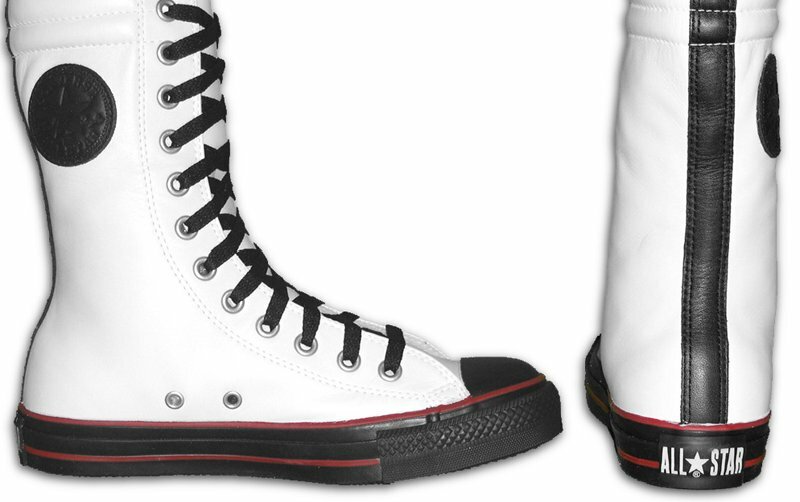 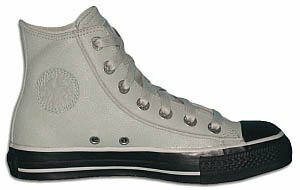 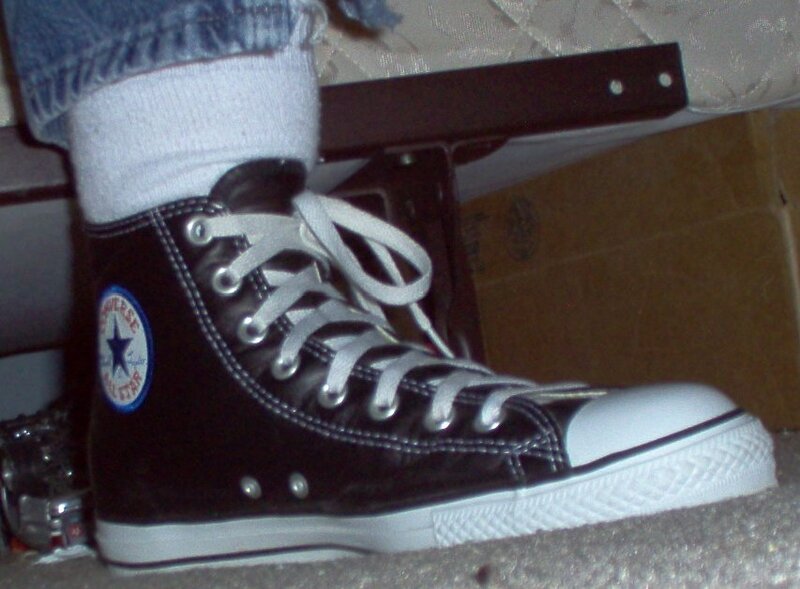 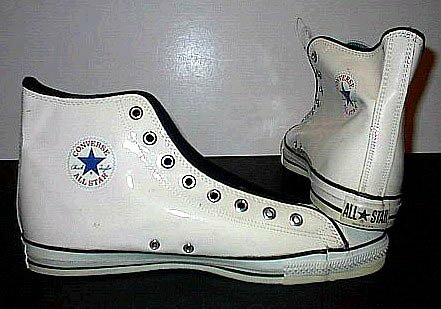 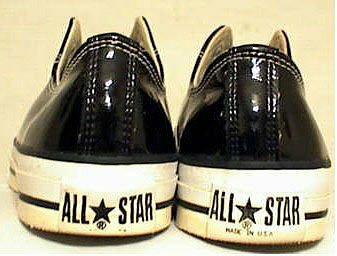 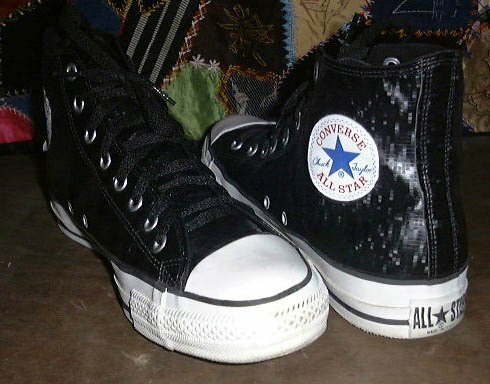 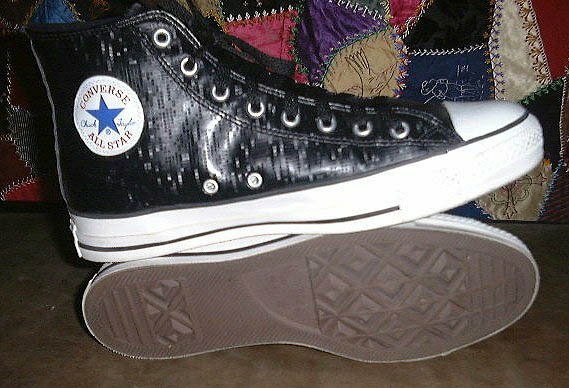 Some were exact replicas of the traditional canvas Chuck Taylor design, while other like the Converse Leather Jewel changed the look and placement of the patch on the high top. 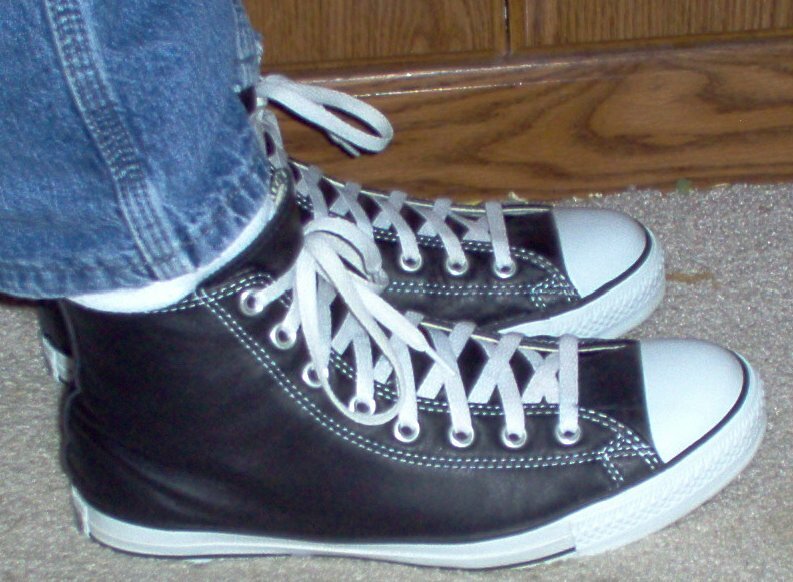 Many leather models are modeled on the monochrome style in black or white.